Man constantly learns how to to think. I would like to add my part to this process with the three - dimensional, spherically shaped chessboard. I give the reader the fundamentals of Globe - chess at disposal, that can be played on its surface. This way I help to set free the independent thoughts of an individual, in order to enable him to test his potential in this new area (dimension). He can find out, where his boundaries lie and at the same time which direction of development should he follow. I believe, that no limits whether concerning ones’s capabilities, or limits determined by science should be accepted. I chose to lay down new rules, without respect to the ancient laws and rules of chess, modifying its most fundamental aspect, the chessboard. If one is willing to think, he will find out that new possibilities and knowledge emerge in the process. On the other hand, if someone is too lazy to think, to learn and explore unknown territories, he accepts his own boundaries. With the creation Globe – chess a new possibility comes for the more demanding chess players, which is demonstrated in the ability of the pieces to move on an unlimited surface. The ability to think in three dimensions is thereby indispensable. The player, accustomed to 64 squares in two dimensions, has to mentally transfer them to the third dimension. As a result of this new situation, the pieces multiply their potential compared to their prior status. Their influence rises to the maximum, and this can be achieved only on a spherical surface. Enhancement of knowledge at any rate offers at the same time possibility to develop creative thinking not just in games, but in any area of real life. As a matter of fact, Globe – chess can be described as playing the original chess game on the new, spherically shaped and therefore endless board, exploiting all its positive characteristics. The sphere eliminates the less favourable attributes of the original chessboard automatically, due to its very structure. The fact, that the potential of the pieces is radically reduced on the edge of the board and and even disadvantageous on corner squares, is such an unfavourable attribute. These drawbacks remain on every two - dimensional board of any shape, because the edges and corners cannot be removed from such boards. The disadvantage is built – in! If the chess board is placed on a sphere, this drawback is eliminated, simply because the sphere does not have any edges or corners! The movement of pieces acquires new meaning and purposes, if the pieces move on the three - dimensional board. A target square can be attacked from a given square in several ways, in contrast to the normal chess board, where a target square can be attacked from only one direction. Consequently, new and surprising variations arise. 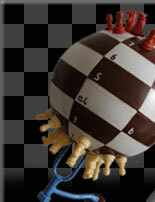 A piece on the spherical chess board always exerts its full potential and can be obstructed only by the player’s own, or the opponents’s pieces. It cannot be stopped by the edge of the board and cannot land on a disadvantageous square in the corner. Moreover, there are two squares (the two polar squares of the sphere, the lower – X, and the upper - Y), where they multiply their power.